Great visit, very good at describing what I had. Performed testing in during the visit and was very efficient with labwork. Dr. Lacerna grew up in Manila, Philippines and graduated from the University of Santo Tomas. After completing a postgraduate internship at the University of Santo Tomas Hospital, he moved to the United States to pursue his medical career in Family Medicine. He completed both his internship and residency at the University of Minnesota Medical Center. Ever since he was a young boy, he has always wanted to be a doctor and care for people in medical need. When Dr. Lacerna is not treating his patients, he enjoys reading, watching movies and loves to travel around the world. Dr. Lacerna is fluent in Filipino. 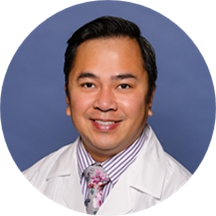 Dr. Charlton Lacerna believes that by establishing a close relationship with each patient he is able to deliver the best medical care with evidence-base medicine. He strives to be a well-developed, compassionate physician and approaches the patient as a whole person, helping them feel their best, regardless of medical history or ongoing health challenges. Good. Doctor Lacerna showed a genuine interest in my health. Great visit! The doctor was direct & informative. Although I arrived about 5 minutes before my appt. My wait time was real short. Doctor seemed to be knowledgeable and specific on plan for me to maintain good health.